5 Acres & A Dream: "Good and Bad Investments for Farmers"
I found an article of that title while searching the internet for something else. I wondered if it might be of as much interest to you as it was to me. 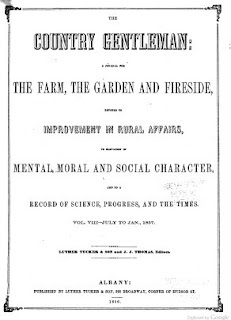 Some, perhaps we might say many farmers, when they find themselves in possession of a little capital, neglect to avail themselves of the safe and profitable mode of investing which is ready always on their own premises, and which is subject entirely to their own control, and too often seek an investment for their spare funds in the stock of some railroad, banking, or other company. This is turning aside farmers' profits from their natural channel, and the consequences are the loss of the profits which judicious improvements in fields or implements, or stock or buildings would certainly hjave yielded them, and sometimes the loss of principal as well as interst, by an injudicious investment in stocks. We have upon a late occasion, as well as upon many former ones, submitted to our readers some suggestions in reference to this subject, intended to persuade them that their safest and most porfitable mode of investment lies within the compass of their own legitimate pursuits. Our columns, also, are at all times abundant in hints as to methods in which capital may at any time be invested to good advantage, as in draining, manure-saving, composting, digging and drawing muck, and other modes of increasing the fertility of the soil; in purchasing improved and really useful and labor-saving implements; or, to name no more, in improving the quality of the stock of all kinds, and enlarging and making more conveninet the buildings of all kinds upon the farm. In these and many similar ways may a farmer at almost any time, make a better investment at home, and in his own business than he can do by the purchase of almost any kinds of stocks, or even of bonds and mortgages. "How many a farmer has lost the avails of ten years' prosperity by buying railroad stocks! Let him do so no more. The farmer cannot trade in stocks with success. This is a species of venture for which his training disqualifies him. Let him throw no more hard-earned gold into this greedy vortex. He will pronounce our advice good if he will notice the facts." I think this is important for those who seek relative self-sufficiency through their farming or homesteading. Many folks assume that investments are the only way to have financial security. That has not always been so and following that same tradition, we can consider investing instead, in our homestead for the security of our future. For the original article, click on this link, and scroll down a bit. It's in the left hand column. Hmm, You know while it may be applicable to you today, I think we also need to take into consideration the US government put out a lot of this kind of propaganda if you will wanting to get the west settled, especially after the Civil war (1861-1865).It was this type of thinking, the subsequent cheap land grabs and the vast cultivation of the mid west that lead to the dust bowl. This article certainly doesn't put forth the fickleness of Mother Nature and farming. Whole communities and states have had major failure and famine because they were not diversified, putting everything into the land. In China, you can see the exact same thing happening as far as the dust bowl scenario. We've believed for a very long time that the best we can do for ourselves individually and for society as a whole is to create a strong base in our own home, on our own piece of land while relearning how to take care of ourselves (and then sharing with others) and regaining self-responsibility and compassion for others. Becoming self-sufficient, to whatever point is comfortable to each of us, may be worth more than any "outside" investments available. Thank you - well timed given the prevailing circumstances of the world. If only bartering was still an important way of life, I reckon that the greed that prevails would've been only the "sin" of the very wealthy. I know that we are going to use bartering whenever and wherever we can in the future. Brenda, there is so much that seems to be lost, and so much of it common sense. I think that's what many of us are trying to work our way back to. Theresa, interesting what as individuals, we classify as propaganda! My family lost it's wealth in the 1929 stock market crash. Almost all of that was in mortgage and banking investments. My grandmother said my great-grandfather never recovered either emotionally nor mentally from that. So obviously I view this from the other side of the fence. I think it is worth noting, that the practices leading to the dust bowl tragedy, are not the ones encouraged by this publication. That was caused by those who only took from the land to the point of total depletion, never returning anything to it. 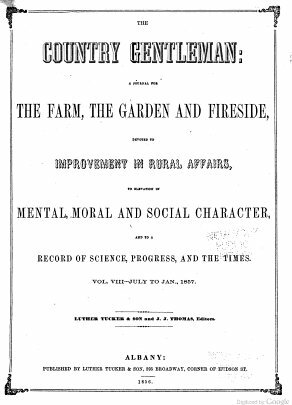 As this article states, The Country Gentleman was consistently promoting the hows and whys of soil conservation and increasing soil fertility, through manure management, composting, improved drainage, etc. The magazine is a treasure trove of such techniques, most applicable to today's small farmer or homesteader. Mama Pea, that's an excellent way to view it. I think the great undoing of this nation is because we have lost that vision. Sadly today, it's take, take, take, whether through greed, entitlement, or just plain selfishness. Dani, I agree. I think as more folks become financially less stable, bartering will increase as a way to meet needs. Very interesting. I would think a combination of both types of investments would be best. We've given up on "investments" (stocks, bonds, 401(k)) years ago and have invested instead in our homestead, our self-reliance, our education and most of all, our daughter. Those paper investments are only as good as, well the paper they are written on. People have been lead to believe that those paper investments are their only choice for retirement or savings or their future. I wonder if it's because it's easier to just plunk down some cash and hope for it to multiply than to do hard work and do things for yourself and watch your LIFE investment grow. Very interesting! Thanks so much for sharing that. Even though we don't have a lot of land, I really consider it our investment, and feel most secure when we build on what we have right here at home. It is certainly what feels right to me! I am reminded of a quote from "Farmer Boy" by Laura Ingalls Wilder, which is full of wonderful wisdom from Almanzo's father. He said "Never bet on another man's game". If you can't control it, how can you judge what the outcome will be? I think it speaks to the fact that we need to look to ourselves as providers for our own futures, and not look to others to hand it to us, or to care as much as we do about it. Look after yourself, that's the way to be sure you come out allright. Laura, I think this is a highly individual choice as you can see from the comments. I think it boils down to what we have faith in. Carolyn, unfortunately many folks have lost their investments even in the past few years, due to the economy. It does make me glad that's not what we've been relying on for our security. Jaime, for those of us able to invest in our homestead, there is a true sense of security! No matter what, we can still eat. Jocelyn, good quote. Funny, but economics and financial security was viewed in a whole different light back then. Both Almanzo's and Laura's fathers equated land and farming with true independence, something not everyone seems to value these days. Perfect Leigh, My hub and I live by this advice as well. When I left my nursing career we cashed in both investment plans and sunk the money into our farm. That way if we lost it all at least WE lost it all, someone didn;t lose the money for us. It's been scarey but everyday I look out in our fields and see our money walking around, eating grass, growing great beef and pork I feel better. Our family of course thinks we are nuts...and yet still buy all their meat from us!